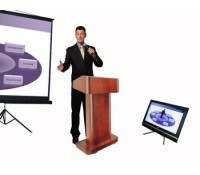 Teleprompter Systems allow presenters to speak on script with confidence. 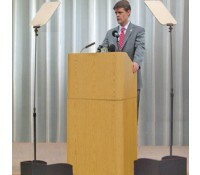 Avista offers presidential, downstage and video camera mounted teleprompter rentals and teleprompter operator services. Avista has been providing expert teleprompter services for the last 10 years. Historically used by CEOs and keynote speakers, they are now widely used by any speaker needing more confidence on stage, making any presentation more polished. Avista offers presidential style teleprompters, video camera-mounted teleprompters, and single to multi-screen confidence monitors (down stage monitors that provide either scripting or multiple images of projected content). Our seasoned teleprompter operators work with the presenter during rehearsals and make final edits to the teleprompter script. We make sure the presenter is 100% comfortable with everything from display positioning to cadence of the script flow. Avista offers teleprompter equipment and operators on a standalone basis, integrating into your AV production, or we offer full audio visual services for meeting and conferences, including projection, sound and lighting. 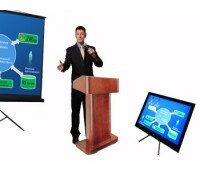 Be able to refer to your presentation without looking back at the main screen with a large confidence monitor rental.